Pink waxy flowers on an upright shrub make Eriostemon australasius a sought after garden plant. An upright evergreen shrub E. australasius is also known as the Pink Wax Flower. 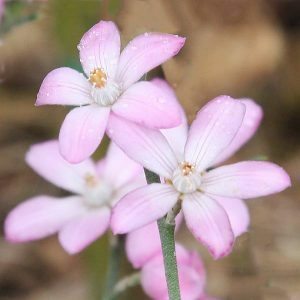 It is the masses of pink waxy flowers from spring to summer that give it its common name. These have been a popular shrub in Australia gardens for many years and make good cut flowers as well. If we understand that Eriostemon australasius comes form open forest we can work out its growing conditions. It requires a well drained soil and a semi shaded position. Although it needs good drainage it does not like to dry out for long periods. Some watering and protection from very hot sun during long dry periods in summer may be required. They do well in pots and can be grown from cuttings. Grafted eriostemon are now available and these are a hardier plant for home gardeners. Despite what you may read the genus Eriostemon has only two real species, and both are from Queensland and Northern New South Wales, these being the popular wax flower, Eriostemon australasius and the lesser known Eriostemon banksii. So where have all of the other species that you read about gone ? Many plants previously named as Eriostemon (such as Eriostemon myoporoides) are now classed as Philotheca (Philotheca myoporoides) so beware of the confusion when reading description of these plants. Soil – Well drained, humus rich sandy loam. Height – To around 2 metres, often less. Spread – To around .8 metres.